Any modern day kitchen isn’t complete without a toaster, perhaps the most crucial component of a fully functioning kitchen. Buying the best toaster for your home isn’t as simple as just picking the prettiest or cheapest model, there are lots of things that need to be taken into consideration to get the best, crunchy, perfectly browned breakfast to start your day on the right foot. Don’t think that you have to spend hundreds to get a decent toaster, with the right research and a little know how, you can get the toaster of your dreams for a reasonable price. With so many different styles, types and models, it can be hard to know which one is worth spending money on. 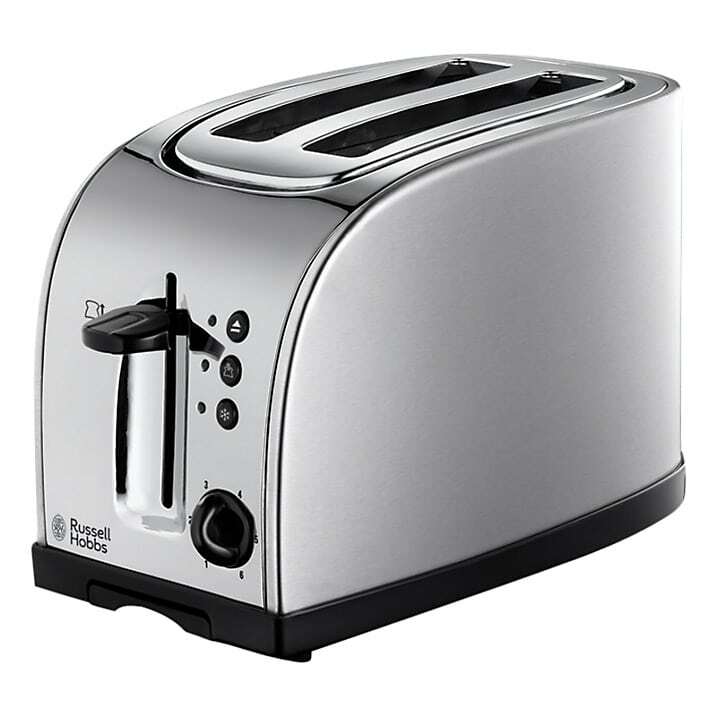 We never want you to experience another bad piece of toast again which is why we have reviewed the top toasters available, to bring you the best deal. A stylish 4 slot toaster with six browning levels, this model is perfect for busy mornings where everybody in the house still has different browning demands. Whip up a plate of toast for all the family in no time or even use the dedicated bagel setting for perfect results every time. We love that this toaster has a defrost function for when you forgot to get the bread out of the freezer, taking the stress out of rushed breakfasts. There is even a kettle to match this toaster if you want to complete the stylish look of your kitchen. A sleek looking toaster with 4 slots for busy mornings and a matching kettle available for the perfect kitchen look. Update your kitchen with this stylish product; it’s the best all-round toaster and offers a marriage of sleek style and power. With 3000-watt power behind it, you can turn your bread into toast very quickly; plus- it has the capacity for four slices. It comes with a lift eject, making it easy to take out your pieces of toast and also has reheat and defrost functions. Do not worry about defrosting bread beforehand; simply drop in your bread and it will be up to the task. In grey, this Breville addition differs slightly from its rival. It has a striking pattern embossed throughout and also has copper handles for the lift eject feature. It’s also available in cream, red, silver and white with matching sets that contain kettles and more. You can even enjoy a bundle offer with the toaster and kettle set. It really is the best all-rounder, with a compact size, stunning style, high power and even has a 1m cord to ensure easy connectivity. This is the best all-rounder because not only does it possess all of the aforementioned features but it also comes at a great price. The Breville Impressions toaster boasts a stylish and textured design, which is perfect for any kitchen. It is a powerful appliance, browning evenly and quickly for those rushed mornings. It comes with four variable bread slots and high-lift eject for maximum control over your breakfasts. The pop and peek feature allows you to keep an eye on the process without having to change the browning settings before you’re good to go. The Breville Impressions comes with defrost, warming and reheating options depending on your needs, making it a good all-rounder. It is a compact design making it perfect for placing on any kitchen surface. With 2100 watts of power, the Breville has undeniable power so you can enjoy your morning bite in no time. Merge both vintage and modern style with this toaster from De’Longhi, we love to see some of the new contemporary twists and this toaster has managed exactly that. This timeless classic integrates many of the old style designs and functions of old kitchen essentials, only it has the power and finish of new innovation. The powerful toaster allows you to do four slices of toast at the same time and you can also control them individually with the various settings. The toaster comes in a cream colour with vintage detail, but it’s much more than a good-looking commodity, it also offers flawless technology that adapts perfectly to the thickness of your bread. It also provides a defrost setting for those that like to keep their bread in the freezer. What more could you wish for, when it comes to toasting bread? It has an extra lift function to help you reach in for smaller slices such as bagels. You can also power it up to its full capability with the 1800-watt power. It comes complete with a non-slip crumb collector that can be easily slid underneath the product, ensuring you’re not unnecessarily cleaning up mess. A stunning addition to any kitchen and the neutral colour makes it easy to fit into most themes. Also operates at high power with a number of impressive functions. Dimensions: H21cm x W30cm x D31cm. This sleek toaster will put a futuristic slant on your theme, with light-up buttons, four slots and a silver trim. The toaster comes in cream and from an aesthetic point of view, it’s certainly a desirable product but it offers a lot more too. It has numerous settings and makes for the perfect family toaster! It is priced at less than £30 making it one of the best value toasters that still manages to showcase four slices and various settings. You can alter how you what your toast to be heated with the two separate dials. You can also throw in your emergency loaf from the freezer; there is no need to defrost your bread before placing it in the toaster. It comes equipped with crumb trays for each pair of slots, and they can be easily pulled out and cleaned. Also features cord storage to ensure a tidy look, a two-year guarantee and touch functions for some settings. Available in Cream, Pastel Blue, Black, Red, Grey and White! A great toaster that seems to have it all, it is available for less than £30 and it features a sleek design. Also has crumb trays, multiple features and four-slices, the perfect family essential! Dimensions: H21cm x W25cm x D29cm. With extra wide slots for thicker bread and seven browning levels, you can have your breakfast however your tastes desire. There is high-lift eject in case you are using smaller pieces of bread or an item such as crumpets, and you can’t quite get them out without risking burning your fingers. These are two little extra levers, so you won’t risk damaging the actual pop up mechanism. There is the usual cancel, reheat and defrost functions as well, which illuminate when in use, so you know what you’ve selected when it is too early for you to be functioning. If you’re a fan of matching sets, there is a kettle available which should please you. The actual toasting process is a bit slower than some other models, but the toast produced isn’t too overdone as a result which is good. Heat control is also a bit more difficult to get exact, and the numbers aren’t overly clear, but once it is all set after a few attempts, we doubt you’ll be adjusting it much anyway. This is the ultimate four-slice retro toaster in cream, sure to add style to any contemporary kitchen. The famous brand- De’Longhi have put a modern twist on a retro design, in cream it comes with an old-school display and a number of options. Toast should be easy and it is with this simple yet sleek toaster. It seems that some of the 70’s style has resurfaced and is now all the rage and it’s no wonder- there is so much style to incorporate into our kitchens. This toaster comes with 1800-watt power meaning it will transform your bread into tasty toast in no-time! It has four-slices allowing you to prepare for the family on the fly without hassle. You can find a display, enabling you to control the colour of your toast and reach your preference. It also comes complete with a crumb tray, making it simple to clean and eradicating any worry of unwanted leftovers being accumulated on your surface. Each pair of slice slots can be operated independently meaning you can put in four slices for different people. The perfect family toaster also comes with a two-year guarantee. The perfect addition to your stylish kitchen, it comes in cream with a retro design and it’s also practical with numerous settings and 1800-watt power. The Russell Hobbs 18096 two slice model is a sleek and striking design, suitable for any kitchen. With brushed stainless steel finish and curved edges, this compact, two slice toaster will sit on any surface with ease. It comes with variable browning controls and high-lift eject, making it suitable for all kinds of bread-based foods. It comes with handy features such as defrost, warming and reheating functions, cutting down the time spent on toasting. With 980 watts of power, the Russell Hobbs 18096 browns bread evenly and quickly. It offers a cancel feature and pop and peek functions allowing you to check your breakfast during the browning cycle. This option is a great addition to any home, however busy. The Breville VTT570 is a powerful toaster that browns bread evenly and accurately. It comes with a number of different handy features like defrost, warming and reheating functions. The browning ability can be altered depending on your personal preference, so everybody in the household leaves the home happy. There are extra wide slots too, so if you have made some thick homemade bread you don’t have to switch the grill on instead. Now for the real selling point. Are you a fan of Warburtons bread? Do you struggle to fit it in a normal toaster? The VTT570 doesn’t just have wide slots but also high slots. Gone are the days of having to turn the slice around halfway through and scold your fingers. Every centimetre of the bread will be toasted, crust to crust. The high-lift eject function is handy for smaller food like crumpets and tea cakes, and the tall compartments toast effectively. It is easy to maintain and clean with its removable crumb tray, and the sleek design makes it a good option for any kitchen. Now here is the gadget if you love your all-in-one items and a toaster-meets-egg poacher sounds a dream. There are two wide slots which will accommodate your standard white sliced/sourdough/muffin/bagel, and the poacher will produce ideal-sized eggs to fit on top. And it will make both in around four minutes, which is probably the amount of time it takes for you to have your coffee ready. There is no need for pans, splashes of vinegar and swirling the water. If you prefer them hard-boiled, simply purchase the additional steamer tray. It will make four eggs at a time so that the whole family can be fed in minutes. There are eight browning levels, to make it even more personal, and a warming tray to reheat your cooked meats. Make sure you read the instructions and know that you aren’t going to get it right the very first go. It sounds like a gimmick, but once it goes right, it is far from it. Toast is the food of the Gods. It’s quick and convenient and is a little taste of warm buttery goodness. These days it’s hard to even imagine a kitchen without a toaster, but buying the right toaster isn’t as simple as it sounds. There is an art to getting your toast evenly browned, crispy on the outside yet still doughy on the inside. With so many different models and types of toasters to choose from, it can be easy to get sucked into all the snazzy features and over the top specifications, which sometimes aren’t necessary. To make your decision even easier we have compiled the top things you need to look out for when thinking about buying a toaster for your home. The size of your toaster really depends on how many people will be using it and the space you have available. How many slots do you want your toaster to have? They normally come with 2, 4 and sometimes even 6. Again this is totally dependant on how many people will be using the toaster on a daily basis. 2 slots is usually enough if you are the only one using it. If it’s for the whole family then a 4 or 6 slice model is sure to feed those hungry mouths. The next thing to consider when buying a toaster is the wattage. Is a powerful model important to you? Why does it even matter about power? The higher the power the quicker the toast. But there is more to it. If you have a high power appliance then you will get crispy toast on the outside and soft bread on the inside. If you opt for a less powerful toaster then you get chewy toast rather than cripness. This comes down to preference but as a rough guide, you should try and get a toaster that is at least 1200 kwatts for a 2 slice model and 1800 kwatts for a 4 or 6 slice model. This also depends on the type of bread you are toasting so think about what one will suit your preference. Depending on the type you get, they will use a different amount of energy. Obviously the bigger the toaster, the more energy will be used. You can get toasters that allow you to control which slots heat up and this can make your breakfast energy efficient. If you want this feature then you will need to look at the specifications of the toaster and see if it’s right for you. These features are only available on 4 and 6 slice toasters and not available for the usual 2 slot toaster. This feature allows you to defrost your bread before toasting. This means that you can defrost your bread without having to change your settings. This handy feature warms up your toast if for some reason you didn’t get to it quick enough and it cooled down. Just flick the switch to reheat your toast without burning your toast or soggy bread. Crumb trays are very important to pick up all the crumbs that fall off your bread in the process of toasting. They are a must have for any toaster so make sure to look for a model with a crumb tray. Some toasters come with a bagel function meaning that only one side of your bagel is toasted, while the other side is gently warmed. Take a look at the specifications to see if a toaster offers this feature. If you regularly toast smaller items like crumpets and tea cakes then a high lifting bread carriage allows you to lift out the bread carriage without burning your fingers. How Much Should Be Spent On A Toaster? Prices range from between £5 to £250 depending on the model and brand you go for. It is all down to what kind of toaster you want, and the additional functions which appeal to you. No frills, simple models can come at the lowest while other more sophisticated appliances can come into the hundreds. How Long Will A Toaster Last Before It Breaks? This is totally dependant on the quality of your appliance, how much you use it and how it is treated and cared for. If you buy a cheaper one then the chances are the toaster will break quicker than one over £50, but still bear in mind that electricals can be unpredictable. If you have a busy household where it could be knocked about a little and you know it’ll last around a year, going cheap and cheerful may be the best option. What Is A Bagel Toasting Function? There are some toasters that come with a bagel setting. This means that one side of the bagel is toasted while the other is only slightly warmed. This creates the best consistency and browning of your bagel. The toaster works to only heat one side of the grills fully and just keep the other tepid.